Focusing on visual storytelling, artistic expression and performance, Youth FX students create digital video projects in various genres, including documentary, narrative short fiction and experimental. Working with experienced media instructors, filmmakers and artists, participants learn the various aspects of digital video production such as cinematography, editing, screenwriting, producing, directing, acting, scoring, sound, and lighting. Youth FX primarily works with young people of color who reside in the South End, Arbor Hill and West Hill neighborhoods of Albany, NY, areas that have been historically under served and in need of meaningful opportunities for training and engagement in new digital media technology. The skills they learn not only enable them to be more creative and express their ideas, but they are also valuable skills that are in high demand in today’s technology based world. Youth FX participants engage in their communities by creating documentary and short fiction films that reflect their understanding and vision of the world around them as well as their imagined futures. For some our program is a fun way to be creative with their peers, and for others it is an introduction and immersion into a potential career path. Films produced by our current and former students and staff have won awards and screened at major film festivals including: BlackStar Film Festival, TribeCa Film Festival, Sundance Film Festival, Los Angeles Film Festival, San Francisco Film Festival, Harlem International Film Festival, Woodstock Film Festival and Chicago International Film Festival. Over the past 3 years we have also developed new programs such as NeXt Doc and the PA Institute to support diverse, emerging filmmakers ages 20-24 as they transition into the field of independent film. Our programs include hands-on technical, creative and artistic workshops, film screenings, youth gatherings, analysis of film theory an history and presenting filmmakers from around the country. Some filmmakers and actors who have done workshops at Youth FX & NeXt Doc include: Lyric Cabral (Terror), Sam Pollard (4 Little Girls, Style Wars), Nijla Mu'min (Jinn, Queen Sugar), Khalik Allah (Black Mother), Miles Joris-Peyrafitte (As You Are), Raul Castillo (We The Animals), Sabaah Folayan (Whose Streets? ), Bing Liu (Minding The Gap), Rabab Haj Yahya (Feeling of Being Watched), Stephen Rickert (Solo: A Star Wars Story), Iva Radivojevic (Evaporating Borders) and Rosa Clemente (PR On The Map). 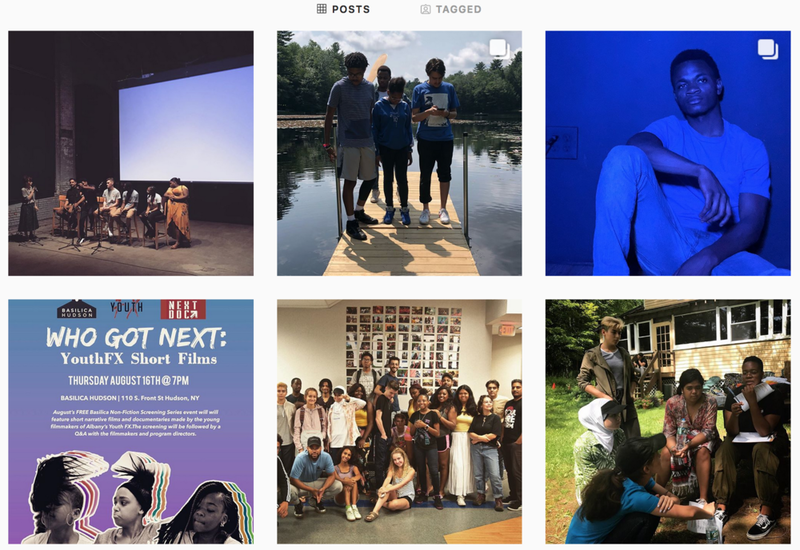 Youth FX is founded and led by people of color and young people and we strive to nurture, develop and empower emerging digital media artists and filmmakers from marginalized communities and build larger networks with other similar minded people, organizations and collectives. Youth FX is part of a broad movement of grassroots media and film organizations that have been pushing for increased diversity and gender equity in the film, television and media arts industries. Please feel free to reach out and connect with us to offer feedback, critiques, shout-outs, ask questions, build connections, collaborate and exchange ideas. YOUTH FX IS OFFICIALLY 10 YEARS OLD!! If you missed our 10 Year Anniversary Fundraiser event at Opalka Gallery, peep our 10 year retrospective brochure below!